This study was undertaken to describe and quantify the measurement uncertainty of commercially available soil moisture sensors in the field. Three different commercial types of soil moisture sensors (TDR, EC and GMS sensors) were placed in groups of 25 sensors each under turf on a 3 × 3 m plot. Readings were taken daily over a period of 10 weeks in order to estimate the extent of measurement scattering and to estimate the change of scattering with time. 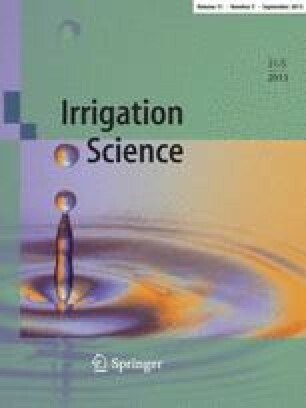 It was found that, on average, scattering changes significantly with time and changing moisture content, and is generally very high (mean absolute deviation up to 16% available field capacity) for the purpose of irrigation scheduling. The difference in scattering between the three methods was significant, so it would be fruitful to seek methods with lower scattering. The assumption that scattering of measurements relative to a starting point in lower than absolute values could not be confirmed.